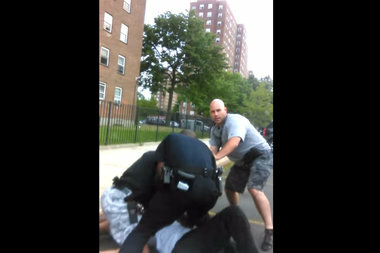 THE BRONX — A Youtube video shows police beating a man they say resisted arrest after he was pulled over for double parking and making an illegal U-turn in Edenwald on Sunday. Timothy Nelson, 24, the man arrested in the video, admits he was double parked in front of a Kennedy Fried Chicken and pulled the illegal U-turn, but he said he did not deserve the response by police. The video begins about 6 p.m. just after Nelson had parked after being pulled over on 229th Street and Laconia Avenue, police and Nelson said. Officers asked for his license and registration, which he gave them, Nelson said, but then they pulled him from the car and started beating him. Police said he cursed at the officers during the stop. The struggle continued in front of a growing crowd of onlookers. One woman is seen recording the altercation with her phone and an officer smacks the phone out of her hand. Officers force the crowd back but the struggle continued off camera, Nelson said. Nelson admitted to struggling during the arrest because of concerns for his safety. “I didn’t feel safe getting in that vehicle with those two officers,” he said. Nelson was arrested for resisting arrest, according to court records. He was also charged with a minor traffic violation and possessing marijuana after a small amount of pot fell out of his pocket during the struggle. The video was first posted to Facebook and Youtube, and then appeared website Photography is Not a Crime. Nelson pleaded not guilty to the charges against him on Monday, Bronx prosecutors said. He's due back in court on Sept. 10. Nelson said he’s used to being stopped and searched but he said that nothing like this had ever happened to him before.